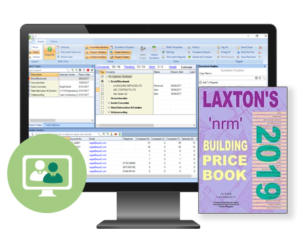 Eque2 exclusively includes Laxton’s SMM7 and NRM2 Priced Libraries within EValuate estimating software, providing resource build-ups with annually updated rates for pricing items directly, or for comparison with your rates or subcontractor rates – making it even easier to start quickly and accurately pricing jobs. Laxton’s building price books are the UK’s leading price library, providing you with access to a huge range of construction cost and industry related information. If you don’t have time to develop and build your own libraries or just want the reassurance to compare rates against subcontractor rates, Laxton’s price books are for you. 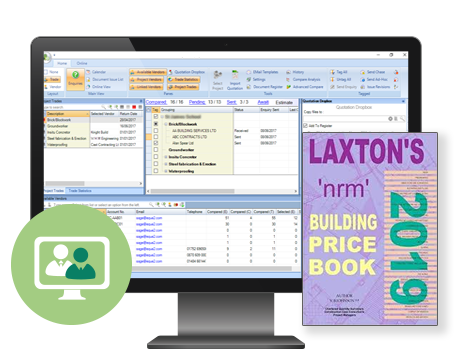 Laxton’s building price books SMM7 and NRM2 libraries are available to EValuate users, along with Laxton’s own resource library. Users can quickly search for items using keywords or drill down through logical levels of headings and sub-headings to insert a priced item into your bill, or copy the library build-up to an existing bill item. Both libraries and resource rates are updated every year, ensuring the most accurate, up-to-date default item rates. Quickly and accurately price jobs using Laxton’s build up’s and default resource rates, or use library rates to compare with subcontractors’ quotations – all providing you with the extra confidence that comes from 200 years of estimating heritage. Helps you to win more work by making it even quicker and easier to accurately price jobs and brings consistency across your estimating team. EValuate’s unique and flexible integration with Eque2’s contract costing and accounting solutions enable you to manage the full project lifecycle from initial enquiry to final account and P&L in one fully integrated solution. Laxton’s clearly have great heritage and are without doubt the leading providers of price book data for the construction industry. Integrating both the SMM7 and NRM2 price books into EValuate creates a truly unique proposition for our hundreds of customers, speeding up and improving the accuracy of tender creation. Justin Moule, Managing Director, Commercial. As a modern estimating software solution, EValuate represents the ideal vehicle to bring our offering to an even wider audience. Industry professionals are increasingly looking for closer integration between the tools they use, and have come to expect up to date information to be available at their fingertips.